Today, via a friends post on Facebook, a new app called Happier. It is a social media application where one only posts happy thoughts or more specifically the "happy moments you find in everyday life." Now you all know that I tend to be cynical of the whole, think-happy-thoughts-and-happy-things-will-happen-all-the-time school of thought. 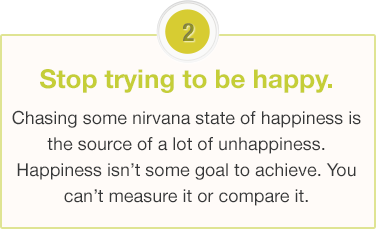 Happier does not seem to be about that, in fact the site actually tells you to stop trying to reach an idealized state of happy Nirvana, it is instead about recognizing the happy moments you have even on those "I want to hide under the covers everything is going wrong days." If you visit the website and take a look at the featured moments they range from finding $10 in one's jeans pocket to having dinner with an old friend to watching sunsets while eating ice cream. You can categorize your happy moments, add pictures to them, tag friends if they are members of the site and if you feel so inclined, smile and comment on other people's happy moments. Okay, I know this all sounds all rainbows and caramel popcorn; your gag meters are likely almost in the red zone so I'll explain just what it is I really like about this idea. When I am feeling down in the dumps, which seems terribly often these days, I am not the type who is going remember to sit and count my blessings or make a gratitude list. And generally when I do think to make one of these lists I start to feel worse because I can't help but compare my gratitude list to those things I think others have to be grateful for or I worry that I might not have enough on my list or I just don't see how what I've got to feel good about outweighs what I am feeling gloomy about. Happier isn't about looking back and taking an accounting of your happiness, it isn't about looking ahead to the things you want to achieve that might one day bring you joy. No, what this app is about is right now and the happiness you are experiencing in this moment. Plus, when you have that moment, however big or small it may be, and you open the app to capture it you see your name and the happy moments you have listed recently. Not a list of what everyone else is being happy about so you can't think, "Oh, my moment is so small...how can I possibly post about how awesomely crunchy my cereal was when Joe just got promoted and won the lottery." Nope, while you can choose to view what your friends happy moments, the app is really focused on you and what you have to be happy about right now. You no longer have to worry about lists because you are making one as you go. And unlike gratitude lists where sometimes you have to mentally stretch to find things you are grateful for, when you look back at your list you will know that in those moments you felt good enough, happy enough that you wanted to capture it. Finally I also like that it is easy. My phone is generally always within reach so I don't need to go for a pen or paper just tappity, tappity, tap and it's noted. I also like that the posts are happy moments, as though the creators want to remind us that all things are temporary. The sad moments pass and the happy ones too, but it is all right now. **I should add no one paid, poke or prodded me to write this. It was done 100% of my own free will. ***You won't find me on Happier under Spinster Jane, I'm there under my own name, which a few of you know!